The smell of the greasepaint and roar of the crowd has tempted the furry cast of Madagascar the movie to forsake New York's Central Park Zoo in favour of treading the boards on a UK tour. The blockbuster DreamWorks film comes to life in Birmingham when Alex the Lion, Marty the Zebra, Melman the Giraffe and Gloria the hip hip Hippo stampede into summer with a great big jungle roar. Imaginative sets and costumes are very much present and correct, in a show that the producers are confident will send your kids home positively wild (which may or may not be a good thing!). Matt Terry stars. What’s On spoke to Matt Terry, X Factor winner of 2016, about his upcoming role in Madagascar The Musical, which is sure to be a fabulous family show. The brand-spanking new production will be coming to two venues in the West Midlands over the upcoming months: New Alexandra Theatre, Birmingham, and Wolverhampton Grand Theatre. We also discussed Matt headlining at the upcoming Summerfest - a huge family festival at Himley Hall, Dudley, complete with food festival, car show and fairground. Summerfest is hosted by Signal 107 and is supporting Mary Stevens Hospice. What triggered your move from X Factor winner and focusing on the music industry to musical theatre - was it your parting from Sony record label RCA Records, or would you have made that career move anyway? "I, for sure, would’ve made that move anyway - it’s something that I trained in before I even went on X Factor. Musical theatre is always something that I wanted to do. The opportunity came up and I took it, so here I am." How does it feel to be making your stage debut with Madagascar - are you nervous, excited, or a strange mix of both? "I think it’s always a mixture. There’s always going to be nervous thoughts running through your head about whether everyone is going to like it, but at the same time I’m thinking about how cool it’s going to be and how it’s such an honour to be playing this part." So you’re playing Alex the lion. In the first film of Madagascar he’s a bit of a leading man performer himself, which has made him arrogant and always wanting to be centre stage. He goes on this humbling journey during the film. Is this similar in the stage version? "Yes, very much so. We very much stick closely to the plot of the movie and the character of Alex is very much portrayed in the same way." How would you sum up the show for our What’s On readers to convince them to come and see the it? "It’s a true reflection of the movie and everybody loves Madagascar - I’d say it’s an iconic film. All your favourite characters have been brought to life through the costumes and characterisation. The music is also so catchy and original, so it’ll just be great fun. Can’t wait to see everybody there!" But, Matt Terry hasn’t left the music industry behind completely. He’s playing Summerfest at Himley Hall in Dudley on 15 July. Are you looking forward to the festival? "Yeah, for sure! It’s so important to remember that these days I can do both - theatre and music. So I’m still making music; I’m still in the studio every now and then. I’m playing at Summerfest very soon and I’m excited to perform my music to everyone again." How do you as an artist change your performance or set from gigs to festivals? "When it comes to festivals, I normally just do my up-tempo stuff - those songs with a more up-on-your-feet and dancing sort of vibe. But, it does depend on the audience really. Depending on the age of the crowd I might choose my more mature songs, or just stick to the fun ones." Many fans were very impressed by your spanish language skills when you collaborated with Enrique Iglesias and Sean Paul last year. Would you like to do more singles in other languages? "Yes, definitely. Spain is where I grew up so that’s kind of my go-to language. I’ve been working on some things already, so stay tuned!" Music from Spanish speaking countries has become increasingly popular over the last few years. Why do you think this is? "To be honest I feel like, even though it’s not new to the UK at all, that people feel like it’s a fresh sound. At the moment the UK is lacking the kind of sound that music from Spanish speaking music brings, so it’s the perfect time for me to be doing it." How important do you think it is that there’s this increasing diversity of language seen in the charts in English speaking countries like the UK and the US? "It’s great - I love it. I guess that’s because I grew up in Spain, but I still think it’s lovely for everyone to have the best of both worlds." Do you think more artists should be collaborating with artists that don’t sing in their language to help this diversification also? "Yeah - why not? I think the more we do that, the more we can connect with other cultures and become one." What are your plans for the future? Do you think you’d like to do more musicals and continue on a stage career path, go back to focus on the music industry, or have the best of both worlds? "I think I’ll just enjoy the best of both worlds for now. I have no idea what’s going to happen in the future at the moment. I could go into another show, or I could release some new music. I’m very open to all opportunities at the moment." Madagascar The Musical is at the New Alexandra Theatre, Birmingham 31 July - 4 August 2018 and Wolverhampton Grand Theatre 6 - 11 May 2019, where Matt Terry will take the lead role as Alex. Summerfest is at Himley Hall, Dudley, on 15 July, where Matt is a headlining act. Dreamworks’ animated film Madagascar was a resounding hit in 2005 and was produced by the same company behind the infinitely popular Shrek movie. Both have now been turned into live stage shows by Dreamworks Theatricals. 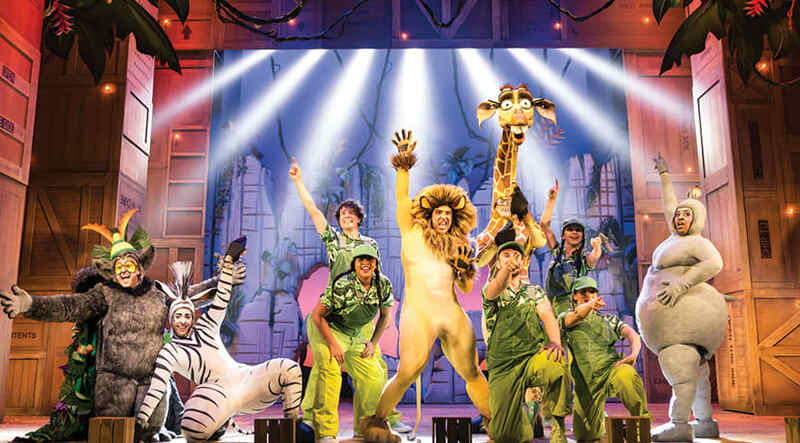 Madagascar Live began in the US in 2011, however its tour was cut short and only ran for three months. It returned over the Atlantic and played cities around the UK in 2013. Selladoor and Hartshorn-Hook Productions have now created a new musical stage adaptation of the much-loved animation and it plays in Birmingham this week. Tom Rogers’ set design is unashamedly bold with all of the different elements. The stage space is very boxed in with the impression of transportation crates lining the proscenium arch and masking further upstage. This must be due to differing venue sizes but sight lines appeared to be an issue if you were too far to the sides of the auditorium. Howard Hudson’s lighting uses a large colour palette to give an animated feel. Kevin Del Aguila’s book forms a pretty simple plot line and is therefore not incredibly exciting. However, for its target audience, it is easy to follow and is loyal to the film. Director Kirk Jameson has done a very good job in bringing the well-known characters to life. The physicality and characterisation is perfect for each role and a lot of time has clearly been dedicated to getting this right. Fabian Aloise’s choreography interprets the musical score by George Noriega and Joel Someillan well with different dance styles showcased. The inclusion of the ‘floss’ dance went down very well with the younger generation during the show’s most recognisable song ‘Move It’. The puppets, designed by Max Humphries, are by far the star of the show. Melman the giraffe is controlled brilliantly by Jamie Lee-Morgan and the ensemble are quite remarkable as the penguins and then also lemurs in Act Two. Matt Terry of X Factor fame is superbly cast as Alex and although initially he seemed too softly spoken, he soon found his feet and his vocal trills are a masterclass in singing. Antoine Murray-Straughan and Timmika Ramsay as Marty and Gloria respectively, and Jo Parsons as King Julien are all brilliantly performed. Parsons is hilarious and although this accent occasionally wavers, he has the best one liners and great comic timing. More specific in its target audience than Shrek but a successful character-led show with plenty to enjoy.